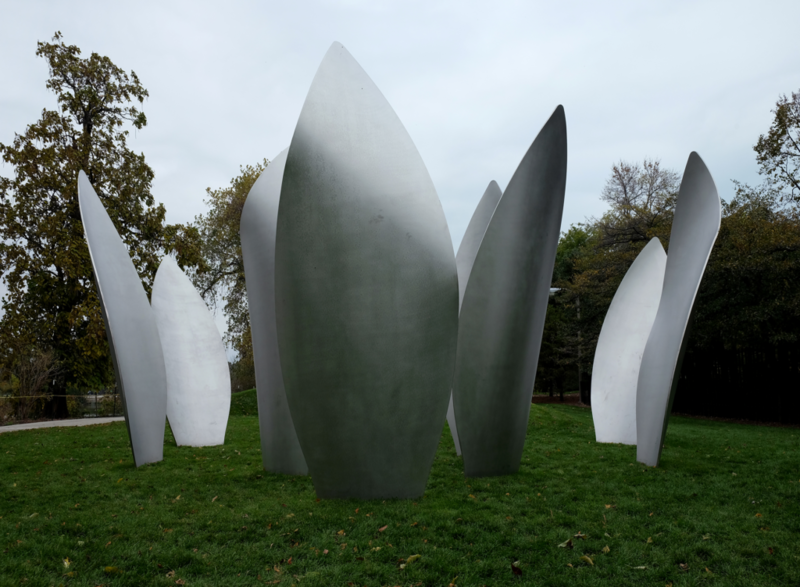 On October 17, Yoko Ono unveiled her permanent public sculpture “Sky Landing” in Jackson Park. The installation, composed of twelve twelve-foot-tall steel lotus flower petals rising from the ground, is one of the many ventures of Project 120, a nonprofit working with the Chicago Parks District and community members to “revitalize the South Parks” and initiate a “South Side cultural renaissance and resurgence,” according to its website. Park-goers can walk through the installation and around each of the towering lotus petals, while simultaneously admiring the surrounding garden in the Wooded Island section of Jackson Park. The installation lies in the Garden of the Phoenix, formerly known as the Osaka Garden, on the north side of the Wooded Island. According to the Garden of the Phoenix’s website, the creation of the Garden was meant to reflect the over 120-year relationship between the U.S. and Japan, and its designs were heavily inspired by Japanese art and culture. The installation is just one of Project 120’s endeavors: they’re also planning a recreation of the Phoenix Pavilion—a feature of Jackson Park that existed during the 1893 World’s Columbian Exposition but was heavily damaged due to arson in 1946. The proposed Phoenix Pavilion will not only house a café and educational and exhibit spaces, but will also feature a Music Court—a large outdoor stage and performance venue right next to the lakefront. Project 120 has also proposed creating forty acres of open space for a Great Lawn in the park, on the current site of a driving range and parking lot. Ultimately, these numerous redevelopment projects are part of Project 120’s ambitious plan to establish The South Parks Conservancy, an organization that “will manage and foster the South Parks in partnership with the public,” according to the Project 120 website. Project 120 lists on its website several local organizations, such as the Jackson Park Advisory Council and Friends of the Parks, as “partner organizations” and advisors. Project 120 has also offered occasional public workshops since January of 2015 in which community members can learn about the process and implementation of upcoming projects. In May, 5th Ward Alderman Leslie Hairston held a community meeting about the park plans with representatives from Project 120 and the Parks District. However, JPW plans to continue challenging and publicizing Project 120’s plans and upcoming projects. JPW organizers have submitted FOIA requests and attended “People in the Parks” forums for several months in order to find out more about the process behind the sculpture installation, but received no response until October 18, when a member of the Park District Board said that Ono’s sculpture “was donated by Yoko Ono and Project 120 and that while the Park District owns it, it will not pay for maintenance,” according to an update on JPW’s website. Ironically, the installation of Ono’s “Sky Landing,” a statue meant to symbolize peace and harmony, seems to only be a harbinger for bigger conflicts that will inevitably arise as plans for the redevelopment of the South Parks continue. Thanks so much for including Jackson Park Watch and the many key questions we continue to raise in this article. Even more questions are being raised by all of the newly restrictive signs now being posted in the Park (see http://www.faceboook.com/jacksonparkwatch). The Park should be for the people who live around, use, and love it, and we are very concerned about what look like efforts to squeeze out the neighbors in favor of a private venture.